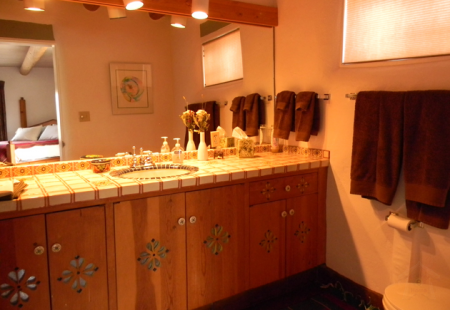 Beautiful, secluded "mountain retreat" 4 BR Taos Ski Vacation Rental House with all of the modern amenities; including: well-equipped kitchen, Satellite TV with DVD, VCR and stereo. This 4 BR Vacation Travel Ski House Rental Casa Especial's jumbo "view" deck with gas grill and hot tub add outdoor living to the 5,000 square foot interior living area making it one of the largest authentic traditional adobe travel homes in Taos, New Mexico. Viga ceilings throughout + five kiva fireplaces offer the true feeling of southwest ambiance and architecture. Radiant floor heat provides even/silent cozy warmth as guests enjoy snow covered mountain views and crackling fires in the "kivas". Most wonderful is the extra large sun room offering several breakfast tables and lounges for reading, relaxing and visiting. 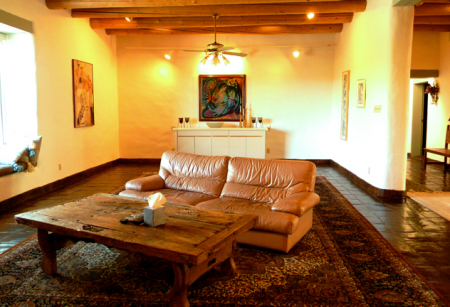 Select This 4 BR Holiday Travel Ski Home Casa Especial with 5,000 square feet of interior living space for your gathering in one of Taos Premiere Properties largest Taos Ski Vacation Rentals.